The University of Toledo is the only state institution in Ohio to offer a bachelor’s degree program in law and social thought. The University of Toledo’s bachelor’s degree program in law and social thought (LST) is the only program of its kind at a state university in Ohio. UT’s robust interdisciplinary LST major is rooted in the liberal arts. The program is based on the view that the study of law and justice cannot be done in a vacuum. Students need to appreciate the connections between law and morality, politics, language, history and power. This humanities and social science context helps UT students better understand modern democracy and law. UToledo’s LST students are curious about the world and want to make a difference. Faculty emphasizes critical and creative thinking — skills that support graduates in a lifetime of work, service and study. Our students have high acceptance rates to graduate and law school. Groundbreaking program. The University of Toledo’s LST program is just one of two in Ohio. It is a founding member of the Consortium of Undergraduate Law and Justice Programs. Innovative curriculum. The LST program has led the way at UT and is ahead of most programs statewide with its curricular innovations. Our program is designed to enhance student participation in their learning. LST students develop their leadership skills and cultivate democratic community by taking a proseminar three times during their undergraduate career. Proseminars meet weekly. UT students come to know one another and the co-directors of LST in a less formal setting. Meetings focus on professional development and intellectual inquiry. Students invite guest speakers and facilitate presentations about career paths and social issues. Students are required to complete a full portfolio before they graduate. Portfolios include written work from courses, reflective essays and journal entries from field experiences. UToledo’s LST majors choose from a broad range of courses from many disciplines. Faculty in other UT departments love LST students because they are self-directed and engaged. UT undergraduates help make decisions about the LST program — which courses are offered, which seminars should count for LST Senior Seminar credit, how to use our budget and which speakers to bring to campus. The Inside/Out Prison Exchange seminar. This class is a highlight of many LST students’ experience. UToledo undergraduates attend class at the Toledo Correctional Institution with incarcerated students.The goal: to open minds and hearts and come to new levels of understanding about social issues. Three credits of required field experience. The LST department considers learning outside the classroom a critical piece of a university education. Students engage in community activism and outreach as well as cross-cultural dialogue. They work in community organizations, government offices and law practices. Many UToledo LST students get internships through the Washington Center or study abroad in Spain, England, Guatemala and other countries. Close partnerships with other UT departments. LST is a founding member of the School for Interdisciplinary Studies in UT’s College of Arts and Letters. LST students often minor in one of the other programs — women’s and gender studies, disabilities studies and others — and collaborate in class and on research and internship projects. A great pre-law track. LST’s strong liberal arts curriculum teaches students to be creative, critical thinkers and writers — valuable skills for attorneys. Our close ties with UT’s law school, UT alumni and members of the legal profession in Toledo help students network and plan a post-graduation path. LST majors can participate in UToledo’s 3+3 program and earn a bachelor’s degree and a law degree in six years instead of seven. UT’s LST students are motivated and finely attuned to social justice. They think creatively and critically. UToledo LST graduates are accepted into top law and graduate schools. Others have been hired by nonprofit organizations, victim advocacy groups and international organizations such as an NGO doing work in the “trash communities” in Guatemala. 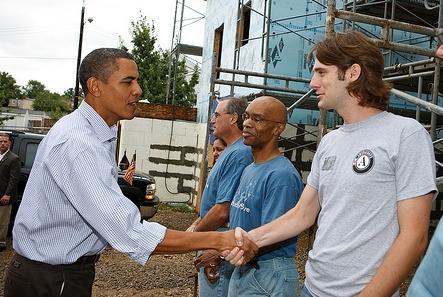 Logan Sheehan, LST ’06, worked for Habitat for Humanity in Washington, D.C. He welcomed President Barack Obama and Michelle Obama to a Habitat worksite and explained the project to them. Logan attributes his capacity to think critically about community organizing and planning to his undergraduate studies in law and social thought at The University of Toledo. He went on to receive his master's degree in the Department of Urban Planning at the University of Michigan. Ashlyn Carroll, LST ’12, began her post-graduate life in an Americorps job at the Food Bank of Iowa. She immediately found connections between her work at the Food Bank and the work she did in the Inside/Out Prison Exchange Project at UT. The Food Bank of Iowa started a partnership with the Newton Correctional Institution. Inmates farm 12 acres of land and donate that produce to the food bank, which distributes it to partner agencies. The agencies hand it out to the needy. Ashlyn visited partner agencies throughout the state, helping them to solicit more donations and distribute more food. Ashlynn has since earned her JD from Case Western Reserve University in Cleveland, Ohio (2016) and her LLM from Comillas Pontifical Universidad in Madrid, Spain. After completing a fellowship at the International Criminal Court in the Hague, Ashlynn now intends to work as a criminal defense attorney in Ohio. UToledo’s innovative curriculum in the law and social thought program includes proseminars, field experiences and classes in many of UT’s academic departments.